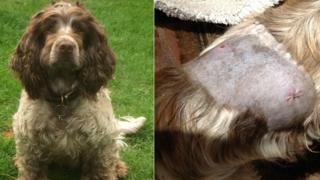 The owner of a dog which was shot with an air rifle has said the sprocker spaniel is "lucky to be alive". Caroline Gallup's dog Joe was shot while playing in the river in Wooburn Park, near High Wycombe, Buckinghamshire, on 28 August. Members of the public had to pull Joe from the water and found "a very round hole in his side and a lot of blood". Thames Valley Police is investigating the incident and appealing for information. Image caption Joe's owner Caroline Gallup said the pellet "could have taken a child's eye out"
Mrs Gallup said the pellet went into Joe's left side, under his spine and ended up lodged in his muscle. "The vet said he was incredibly lucky, it was millimetres from his spine," she said. "Joe is such a happy dog. It is outrageous for him to be shot. "He is getting back to himself now, although he has been left with an unfortunate haircut." PC Paulina Wodzynska said: "We would ask anyone who may have seen this incident or anyone who saw someone acting suspiciously in the area to come forward."